Freerails > Model Railroad Forums > Way Back When > The 'Freerails' 0-4-0 Class-A 'Banner' Loco ! The 'Freerails' 0-4-0 Class-A 'Banner' Loco ! I have used a system of not fastening the body down. Located by a couple pegs, if nothing else, the body can be carefully lifted off for battery charging. The loco does not have to leave the track. But then we R.C. people are different. 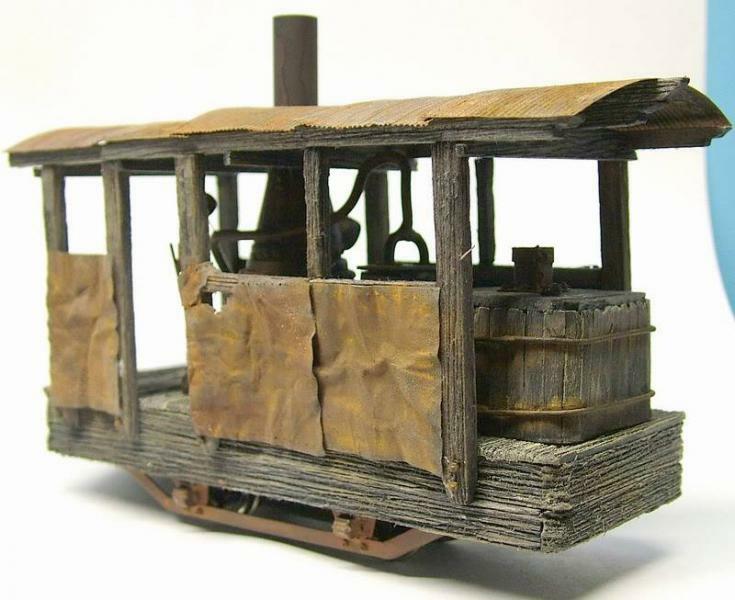 Model railroaders are alchemists: We turn gold into rusty iron. Do you have a photo of your peg location method, by any chance? My creations will be battery powered also, so convenient removal of the body is desired. I get that tag line. Left the engineer with a worried mind"
"Monkey and the Engineer" is a Jesse "Lone Cat" Davis song. He was a one-man band in San Francisco and all the Bay area musicians loved him. Based on your profile pic and your location, you're probably familiar. I do a lot of them. Probably half of my song list is songs either about trains or referring to trains in some way. I don't do Terrapin, though. That little thing has character. Will be interested in seeing what eventually becomes of lamp idea. I got a couple of the Hawthorne Village On30 trolleys on eBay for less than $30. I am looking forward to creating a couple of funky little beasts of my own. The mechanism really has lots of potential. The great photos from this fantastic Thread, were HIJACKED BY PHOTOBUCKET last year. ... due to PhotoBuckets recent, probably in vain, attempt to save their company. PHOTOBUCKET.COM HOLD MILLIONS OF USERS & BILLIONS OF PHOTOS TO RANSOM ! ... will hopefully happen, after the trillion other things that need doing ! But for NOW at least ... the Freerails loco IS BACK ! The worlds most funky lokie ? Rolling rust & dry rot ? Loggers entry for the 'Indy 500' ? You can decide for yourself !